The search for a comprehension of exactly what color is and how it functions has been going on for hundreds of years. Numerous models and systems have been developed, and the following is an attempt to summarize some of the major leaps that have been made to bring our understanding to its current level. The first known studies of color were done in ancient Greece by Aristotle, who theorized that color existed in the form of rays sent down from the heavens by God. His theory was not disputed until the Renaissance when more sophisticated color systems were developed by Aguilonius and Sigfrid Forsius. Aguilonius's system was the first attempt at defining all colors and was based on his observations of the changing color of the sky from dawn to dusk, (see below). In 1660, Sir Issac Newton developed a more logical color order based on his scientific observation from experiments. Using a prism, Newton acknowledged that white light could be broken down into the colors of the rainbow, and as such had a clear, set order. Newton's work in optics led to his creation of the color wheel. The next big jump in color theory did not come until the early 1800's, when Johanes Wolfgang Goethe challenged Newton's ideas and created his own color system. Newton's and Geothe's approaches were very different. Newton's studies in color were scientifically based, while Goethe's interest was more in the psycological effects of color. He wished to investigate whether rules could be found to govern the artistic use of color. Originally he planned on creating an improved color wheel, but later Goethe found his ideas were best expressed within an equilateral triangle. (see below) Goethe's theories and his triangle will be explored further in the Goethe's Triangle section of this page. 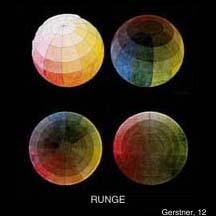 Also around this time Phillip Otto Runge developed a three dimensional color model in the form of a sphere. His theory was revolutionary at the time, and it attempted to arrange colors based on hue (red,cyan,orange,etc..), whiteness, and blackness. You can see from the two top views in the example, that the pure hues on the outside of the sphere lighten and darken as they reach the two poles. Horizontal and vertical cross-sections are shown below them. In 1872 a Scottish physicist, Sir James Clerk Maxwell, developed a chart in the form of an equilateral triangle from his studies of the electromagnetic theory of light. His triangle is very similar to Goethe's, both are equilateral and both choose three primaries which are combined to produce the inner colors. Maxwell, however, believed that he could produce all the known colors within his triangle, and he choose red, green, and blue as primaries. In 1915, Albert H. Munsell, an American art teacher, used the work of Runge as a basis for the development of his own 3D color space. This space is based on pigment, not light. He begins with Runge's sphere, but he works from two observations that he has made as a painter. The first is that pure hues vary in their degree of lightness, and therefore all the pure hues (red, yellow, green, blue, violet) should not be on the same horizontal plane. The second observation is that some colors(red) are more vivid than others(green), and therefore,they should be further away from the axis. These observations all pointed Munsell toward a color space whose shape was very irregular and asymmetric, as shown below. Munsell's color solid has remained very useful, and is used by paint manufacturers, artists and designers. In 1931, an attempt was made to establish a world standard for the measurement of color by the Commission Internationale de l'Eclairage (CIE). They generated a version of Maxwell's triangle, choosing a particular red, green, and blue from which to generate all the colors. The result became known as the CIE chromaticity chart, the updated version of which is used to measure and quantify the light produced by computer phospor guns today. With the advent of the computer age, many attempts have been made to create an ideal color space model based on the red, green, and blue primaries of the computer screen. The simplest model is the RGB Cube, with corners of black, the three primaries(red, green, blue), the three secondary mixes(cyan, magenta, yellow), and white. 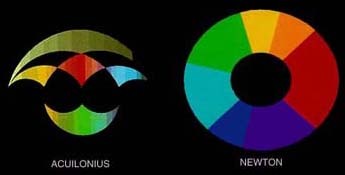 Although this creates an accurate representation of the colors that can be produced on a computer or television screen, it is only intuitive to someone already familiar with RGB mixing. Other models, that were created to describe a color space that would be more natural to the user, include HSV space(hue, saturation, value) and HSL space(hue, lightness, saturation). 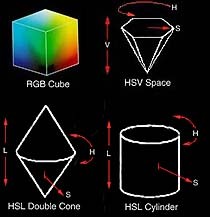 For this site, we have created a model of the HSL Double Cone and of the RGB Cube. We choose the HSL Double Cone because we felt it was the most easily understood, and it corresponded in many ways to pigment-based models. We choose to include the RGB Cube model to allow you to become more familiar with mixing red, green, and blue color values, and to emphasize the differences between pigment-based, artistic models, and electronic, science-based models. On the next page you will find an example of the color chooser, containing both HSL and RGB spaces, that you can explore. You will also be using this to choose colors in the upcoming exercises. Below, you will see a static version of the color chooser, displaying both the RGB and the HSL color spaces. You will be able to flip between these two spaces on the chooser by clicking the "Change Color Picker" button. In the RGB color space, you may use the red, green, and blue sliders to change your color. A rectangle containing you current color selection is shown on the left. The amounts of red, green , and blue (on a scale from 0 to 255) are indicated in the text box beside the slider, and a visual representation of the amounts are shown on the sliders themselves. Experiment with mixing different amounts of red, green, and blue to create different colors and notice how different it is from pigment-based mixing. In the HSL color space a horizontal slice of the shape is shown on the left and a three-dimensional representation of the shape is shown on the right. As in the RGB chooser, a rectangle containing your current color selection is shown on the left. The color can be chosen from the 'slice' by clicking on the black out-lined circle and moving it around in the space. Also, different slices can be choosen from the shape by clicking and dragging the slice up and down. By manipulating these, you can navigate through the shape to find your desired color. Note: You may need to resize your browser window.